Howard was raised in Manilla, Iowa on a cattle ranch. He was an outstanding football player at Grinnell College in Iowa, and was a Liberty Magazine All American Center in December 1939. He was subsequently named a Silver Anniversary Sports Illustrated All American in December 1964. After graduation he was given a contract to play with the New York Giants, which he declined and instead joined the Aetna Life & Casualty’s Group Insurance division. 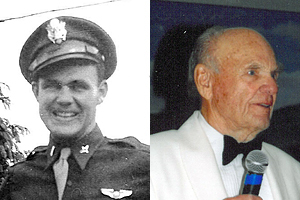 His career in group insurance was interrupted when he joined the Army Air Corp, serving in WWII as a C-47 pilot. After the war, in 1945, Howard found himself assigned to the Concord, NH area where he sold Life Insurance, Health insurance and Pension Plans to the mills of northern New England. This was the infancy of group Insurance and the plans he offered were $1,000 of Life Insurance ($500 for women) and a $15 “sick benefit” ($10 for women) along with a daily Hospital benefit of $7 ($5 for women). Howard also introduced a few prosperous companies to Pension Plans, a novel idea at the time. In 1949 Howard was promoted to General Manager of the Boston office, and then promoted again in 1950 to the head of the New England and Northeast Region for the Aetna Group Benefits division, ultimately becoming a Sr. Vice President. Howard’s clients included: The Great Northern Paper Co, Cabot Corp, Bird & Son, The Wm Carter Co, NE Confectionary, State Street Bank, Harvard University, Textron and The Commonwealth of Massachusetts which was the largest Health Plan Aetna insured at that time. After 40 years in the employee benefits business, Howard “retired” from Aetna and formed Benefit Services Incorporated with Jack Coughlin in 1981. There he continued working in the group benefit arena until his retirement in 1993.